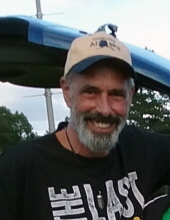 Gregory J. Manning, age 59, passed away March 30, 2019. He was born October 13, 1959 in Clinton Township, Michigan, son of the late Christopher and Mary Manning. Greg loved music and he was an avid and talented deer hunter. Most of all, his grandsons were the love of his life. He loved being with his family and friends and he will always be remembered as a loving and caring man. Greg is survived by his wife Angie of 5 years; his step-children: Scott Liddell and Kyle Liddell; his two grandsons: Daniel and Jack; and his siblings: Paula, Julie, Mike and Brad. Greg is also survived by his sisters-in-law and many nieces and nephews. He was preceded in death by his parents. A funeral Mass will be celebrated on Friday, April 12 at 9:00AM at St. Thecla Catholic Church, 20740 S. Nunneley Road, Clinton Twp., MI 48035. To send flowers or a remembrance gift to the family of Gregory J. Manning, please visit our Tribute Store. "Email Address" would like to share the life celebration of Gregory J. Manning. Click on the "link" to go to share a favorite memory or leave a condolence message for the family.